Digital marketing is a very hot topic that a lot of businesses don’t know much about. While most organizations have Facebook, LinkedIn, and Twitter pages, they’re missing out on great opportunity to increase profits with social media marketing and advertising. In this webinar, we’ll talk about the differences between both and how companies can leverage their social power to capture more leads and drive profit. Today technology affects almost all aspects of our lives. Amazon is a great example. Five years ago, buying a book meant physically going to a store to make the purchase. Today a lot more people are placing their orders online and are subscribing to a prime membership to get their orders delivered the following day. Speed and convenience are key drivers for the success of ecommerce. ▸ The Managed Services Model: Advantages and pitfalls to be aware of. ▸ Peer-to-peer advice on the strategies and tools to implement and run a profitable business. Avast Business provides integrated, enterprise-grade endpoint and network security solutions for SMBs and IT service providers Backed by the largest, most globally dispersed threat detection network, the Avast Business security portfolio makes it easy and affordable to secure, manage, and monitor complex IT environments. The result is superior protection that businesses can count on. 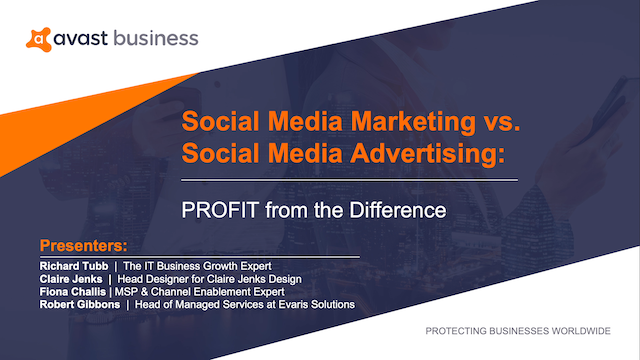 Title: Social Media Marketing vs. Advertising… How Can You Profit from the Difference?